An Post, the postal service in Ireland, has announced their upcoming line of collectors edition stamps for the next three months. 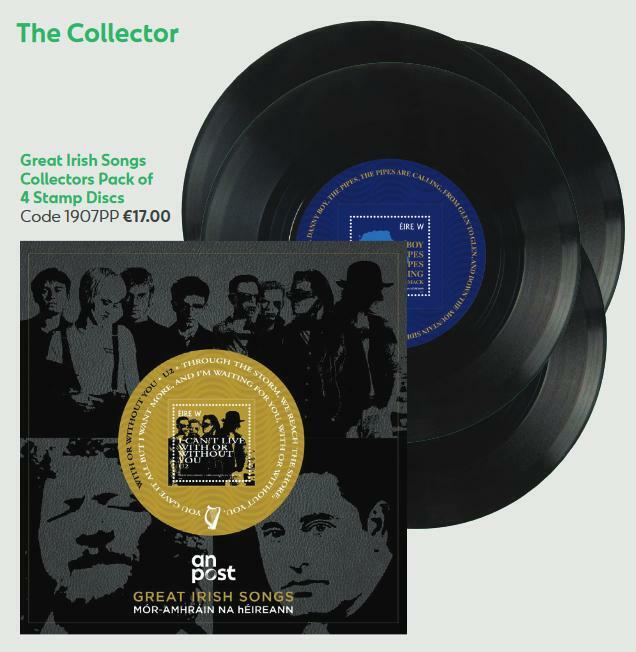 The stamps, announced yesterday in their quarterly update The Collector, they have announced a special line of stamps celebrating the songs of Ireland. “Irish songs, singers and songwriters have made a huge contribution to Irish life and our national identity over the years. 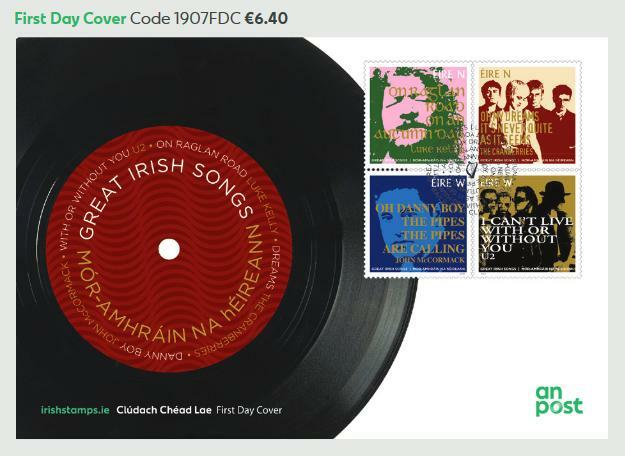 On May 2, we acknowledge this role by issuing a set of four stamps on the theme of ‘Great Irish Songs.’ The stamps are designed to be a further, imaginative way of highlighting the stories with each iconic track while also intensifying our engagement with customers,” writes Aileen Mooney. Four songs are featured in the collection including “Danny Boy” by John McCormack, “On Raglan Road” by Luke Kelly, “Dreams” by The Cranberries, and “With or Without You” by U2. The U2 stamp uses a photograph of the band from The Joshua Tree era, printed in gold and black, with white text with the name of the songs. The stamps are designed by a familiar name, AMP Visual Design has designed all four stamps. Each stamp will be printed in multiple colours, and each will include “shiny gold foil” and “phosphor tagging”. Tagging means they are coated with a special coating used to activate automatic mail-handling equipment, which can only be seen under ultraviolet light. Each stamp will be 36mm x 36mm in size. Quantities of each stamp produced will vary. 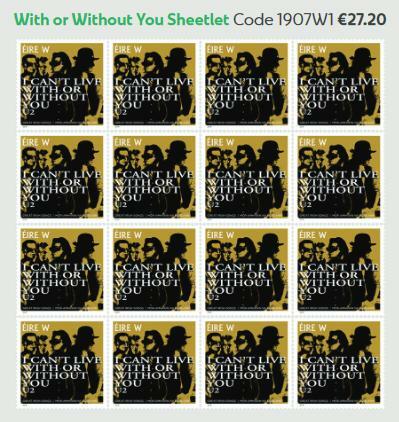 The “With or Without You” stamp will be printed with 250,000 copies being made. The “Dreams” stamp will be the next most highly printed with 150,000 copies made. Both the “Danny Boy” and “Raglan Road” stamps will be produced in a smaller 94,000 copies. The “With or Without You” and “Danny Boy” stamps are worldwide stamps, and the “Dreams” and “Raglan Road” stamps are national stamps, noted by the W and N on the stamps themselves. The Worldwide stamps, including the U2 one, carry a price of €1.70 while the national ones are priced lower at €1.00. Online orders for the stamps will start to be taken through the irishstamps.ie site later this month. Stamps will also be available for individual sale in post offices once they are released, but you will not be able to buy the single stamp format online. 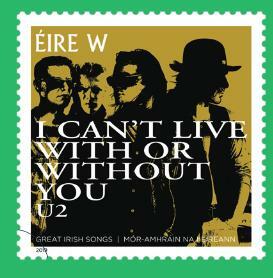 This is the second time that U2 has been featured on a stamp from An Post. 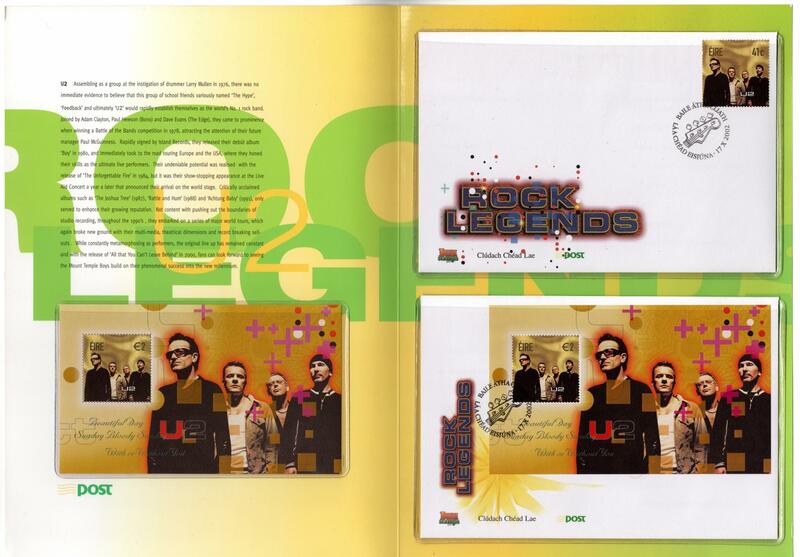 In 2002 there was a series of stamps issued that featured U2 on a stamp by themselves, which carried a price of €0.41. The stamp in 2002 was based on a promotional photograph of the band from 2000 taken by Kevin Westenberg. That set of designs, called “Rock Legends” was designed by d5 Design. They were released on October 17, 2002. The other artists featured in the 2002 were Phil Lynott, Rory Gallagher and Van Morrison.